Computing for the older generations. I feel like I am an old man just typing this post. But I am rapidly coming to terms with a new role in the technological world. That roles is as an ‘educated older man, to build solutions, not for the upcoming generations, but for my generation and one either side…’. That does not fit on a business card though…. The current generation of computer users barely actually use computers. They all use cell phones and tablets, not those archaic boxes that we (my generation) call computers. They do not have any idea about ‘running’ a program, they simply use an app. They do not save data locally either, everything is expected to be available regardless of which device they use. Nobody keeps a diary, that is what Facebook and twitter is for. You do not e-mail your friend a photo, you either MMS it to a single recipient or you post it on Twitter or Facebook or you pin it or you instagram it. Memories are now transient – the only inkling that you existed a few years ago is that you posted a photo on Facebook or maybe a video on YouTube. Sales of actual physical photo albums are limited to the over-40’s set or maybe even older. If you want to read the news, or read a book, your do not bother with pysicall paper copies, you pick up a connected device and you carry on where you left off, or you fire up cnn.com or maybe bbcnews.com. But what about my generation (+/- 1) ? How do we embrace this technological revolution ? How do we transition from our pocketbooks and paperbacks and our roladex and IBM Quietwriter III ? Heck, how do we drop our laptops and transition to tablets ? I ask myself this, but I realize that I am asking the wrong person, because I have already made mostly this transistion, I have already embraced the cloud and I totally expect that a photo I take with my phone is available within a few minutes on my iPad or my laptop or, if I was to ever bother with it, my desktop. Come to think of it I expect any photo I take to be available in the cloud too for whatever reason I may want it. But this is not how most of my generation think. They are stuck in the days of downloading and uploading and e-mailing (maybe) photos, with fighting USB cables and whatnot, they are stuck in the days of disconnected devices. When talking to people about software, they struggle to cope with the idea of, for example, assigning a task to anyone else without writing it on a post-it note and sticking it to someone elses’ monitor, then adding a note to their desk blotter to follow up. Surely a better way is to send them a task to their phone that reminds them to do something ? This kind of drags them into the current generation, maybe. I think that local processing is going to die a death. Maybe not today or tomorrow, but within a few years. The replacement will be simply a secure cloud connection via whatever browser on whatever device you happen to have available. This is somewhat ironic really, because I started my career about thirty years ago with ‘dumb terminals’ connected to a mainframe. 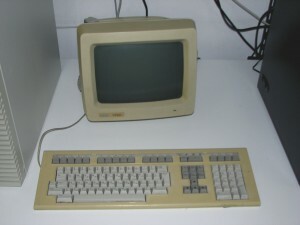 The terminals were little more than a keyboard and a screen, connected to a centralized computer. When you typed on the keyboard (and pressed exec) the contents of the terminal buffer got passed to the computer and the results would be passed back to you. While those Wyse85 or VT220 VDU’s would not display graphics, the idea of passing data to a centralized server and it returning the results without any real local processing ability. All data lived on the main computer, nothing lived locally, you could access your data via a login and password easily. Sometime later my love affair with Unix began in earnest, the early unix machines allowed for different types of terminal – the simple character based VT220 or Wyse (etc) terminals for low-end users, plus also the amazing graphical devices. These X-Term devices had a degree of local processing in order to accommodate a highly graphical display (in its day), but all files and data was stored on the main computer. If I logged in on any of the X-Terms, all of my data, preferences and even my desktop was available for me as though I had used my own workstation. Even if I accessed the Main computer via my home Solaris machine over ISDN, all of those files and preferences migrated with my login. Just like if I access a cloud based application from any random PC or tablet or phone today…. Back in those days we had person-to-person messaging, system announcements and even a ‘wall’ which was a public message area. We could choose to share folders with each other too. Hang on, this sounds rather a lot like the thing that we have come to think of as ‘social media’. The major difference being that the audience is global, rather than limited to just a single machine. 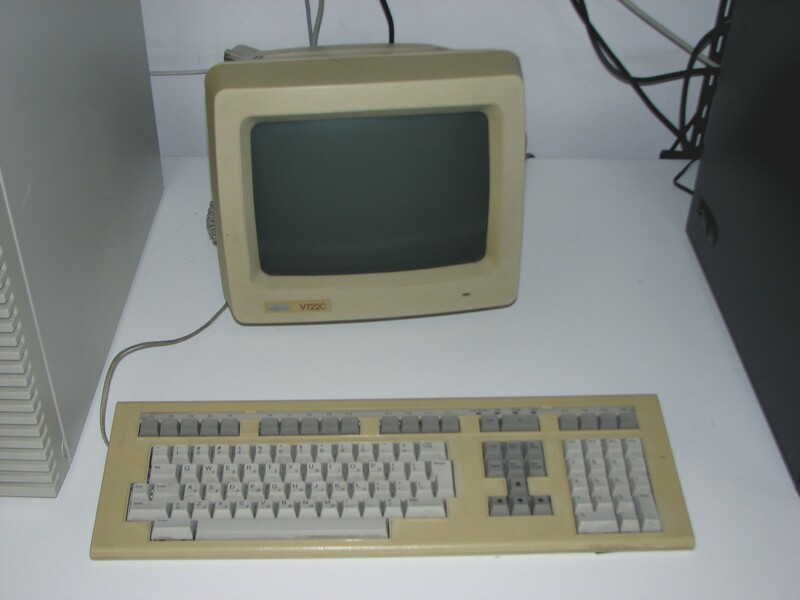 Sometime around the early 1990’s, home computers started to gain popularity. Because a connection to the internet was both slow and expensive, the concept of local storage and local processing took hold. Sharing reverted back to one-to-one via e-mail mostly, but also via tools borrowed from the Unix days. (FTP etc). Slowly bulletin boards emerged to support the new machines, again if I logged into Rusty an Eddies, my preferences all remained regardless of the machine I used to connect – assuming I could connect. The detour to local storage and local processing has become ingrained, rather than making data available to yourself via a cloud storage (eg docs.google.com), it seems that we are happy to carry around either USB drives or multiple copies of important stuff. Or simply not carry it and (shudder) print things out and carry a hardcopy. We are rapidly approaching the stage where what I once new as ‘roaming profiles’ are relevant, where local storage is barely needed and even local processing is only really needed for graphics and local data searches. So how do we (my generation +/- 1) actually deal with this ? How do we ween ourselves away from the concept of having just one copy of the data (on our desktop or laptop) ? How do we embrace that cloud ? More to the point, how do we ensure that the precious photographs and documents that we store today digitally can be handed down to our future generations ? Or do we accept that when we die, so does our data ? Is that really such a bad thing ? It occurs to me that we have gone full circle, thirty years ago everything lived on a remote computer, the terminal was dumb. Now with ‘cloud computing’ everything lives in the cloud and very little is stored locally. Odd that – I like circles…. I read with great interest, the thoughts printed above,and can but agree.With regard to the storage of photographs I have today ordered 103 prints of my latest holiday to be stored, in an album.Which I fully realise that some time in the future will be unceremoniously dumped in a skip when my family sort out my effects.Yes, circles, you are totally right………..
Why I am sick of Samsung Android devices…. Becoming a little less fat..